I was invited to The Rock School for a 2 hour introductory workshop. 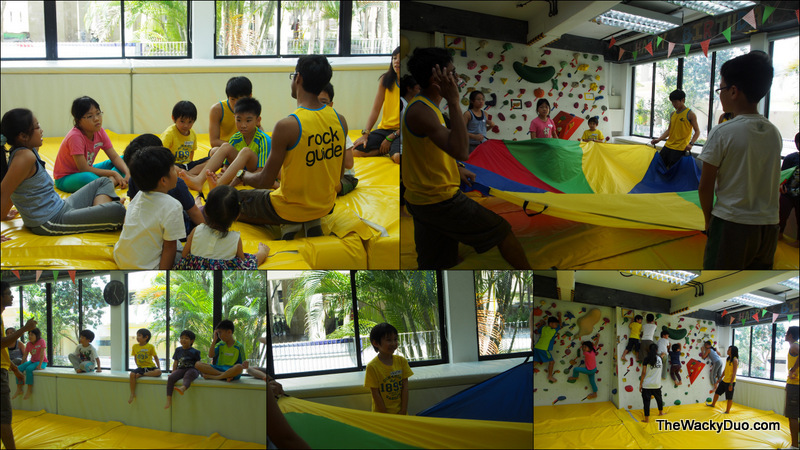 Rock Climbing as stated by the school is one of the best sports to develop a child’s psychomotor, cognitive as well as affective skills. This sport intrigues our little minds and challenges our physical abilities. I love physical exercises and obstacles ( I am a semi-pro at the indoor playground). My Daddy thinks I am ready for rock climbing, but Mummy was not sure about the class as she knows I have a fear of heights. A good thing for this class is that parents are encouraged to watch and cheer which would boost my confidence. 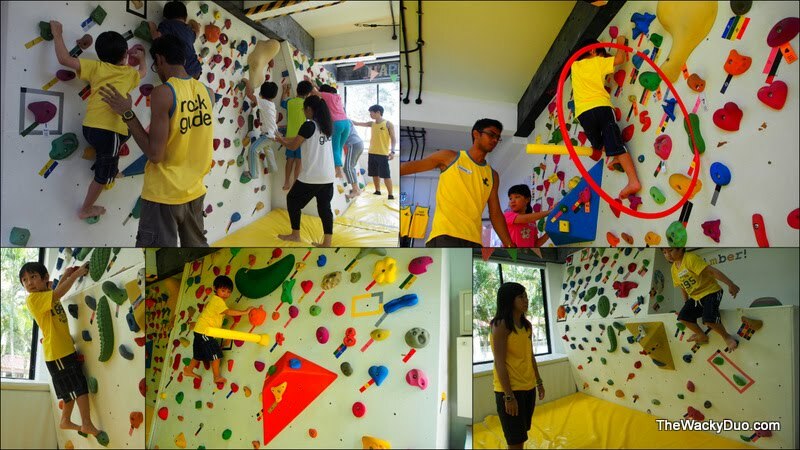 Rock Climbing Course for kids! Initially I was hesitant about taking the class, especially since Louis cannot participate in it. Need some brotherly support! However after some subtle persuasion by Mummy, I decided to give it a try. 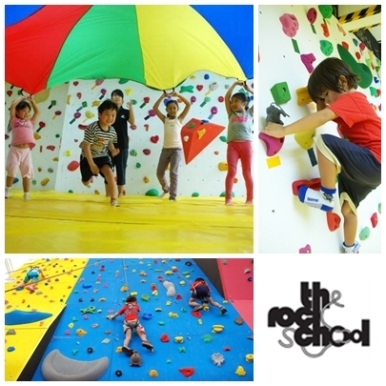 The Rock School is located at Bedok CC. I am quite familiar with the area as I had accompanied my cousin to some dance classes before in the CC. The class is conducted in 3 phrases by youth Rock Guides led by Instructor Fadhil for our class .There are adequate Rock guides in the class to guide us along and pay ample attention to us as an individual. The group that is participating ranges from age 5 to 14. Fellow nominees in the Singapore Blog Awards ‘The Cheekie Monkies ‘ were there as well. The circuit is known as the Junior Power Circuit and prove to be a great practise session for most of us who are first timers to the sport. Spiderman , here i come! Touch the Volcano at the end! After an hour of practice, the instructor decided that we are ready for the big wall. We were all suited up on harness to prepare for our climb. The instructors had demonstrated to us what we should do when we were up the wall. They had also taught us how to come down from the wall. However the ‘warnings’ of having my head splatter on the wall should I do it wrongly got me all spooked! I got real worried and my face turn white as I took their words literately. There are 4 targets that have been set out for us. They are the Slope, the hill, the mountain and the peak. Each station depicts how tall we will be scaling. The peak is about a 3 story height. The climbing was not the issue, I had some problems trusting the robes on the descent. Every time we reach a milestone, we will receive one sticker to indicate we made the climb. The next stage was The Hill. I had managed to reach the top, however I was afraid of letting go of the rocks and trusting the ropes during the descent. As a result, I decided I needed more practice before I proceed any further. Maybe Little Lou can join me in the future and perhaps I would be more confident then. There were other kids in the class. Some of them had managed to reach the peak. Overall it was enjoyable even if I did not reach the top. It’s a new experience for me. Daddy hopes that this activity will make me more confident about heights in the future. Thanks to The Rock School for this experience. Special thanks to our instructor Fadhil for his engaging tips and attentive guidance to us for this workshop. The Rock Challenge and Carnival 2012 is the first rock climbing competition and carnival for children age 4 and above. There will be fringe events like balloon sculpting, parent-child climbs and shopping booths for parents together with rock climbing activities. This review was due to an invitation from the rock school. A complimentary workshop were given as part of the review. No monetary compensation was received. All opinions are of my own.